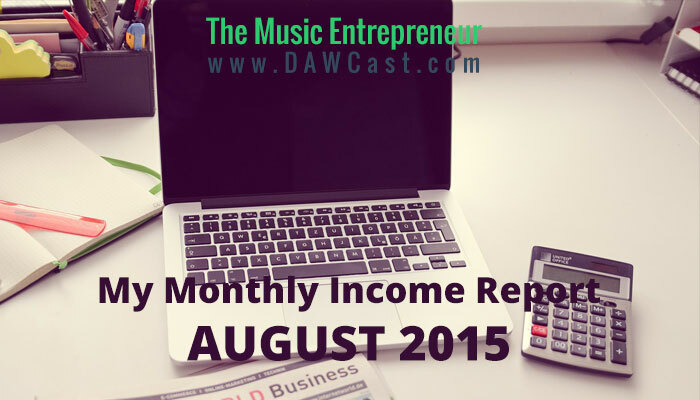 August was not a lucrative month, but a steady one nonetheless. I didn’t make quite as much music-related income compared to June or July, but I have other revenue sources, and they tend to make up for the difference. It’s amazing how one thing picks up when something else winds down; this is exactly what a freelancer hopes for. In addition, September is already shaping up to be a better month in many ways, and I will have lots more to report on in 30 days. Of course, there is still the reality that I haven’t seen any sales reports for my eBook as of yet, so while I know for a fact that there have been sales, I have no way of telling how many. The fluctuating rank of the book on Kobo and Amazon at least points to the fact that there has been some interest. By the way, if you’ve had a chance to read it, please consider leaving a review on Amazon. I don’t know why, but as with leaving a review in iTunes, it really helps it gain more visibility. Anyway, let’s move onto the numbers. There are some notable caveats that you should be aware of when looking at these numbers. Please refer to my first income report (under “What You Need To Know About My Income Breakdown) to learn more. Although I would love to show an increase in my income month after month, a little bit of fluctuation is both realistic and sometimes inevitable in the music industry. If you plan accordingly, you’ll never feel like you’re in need though. As I mentioned earlier, some of my web design, content or theatre tech work tends to make up for the differences, and none of those numbers are shown here. If you think I should be showing everything – both in terms of income and expenses – let me know in the comments below. This is one of the busiest summers I can recall, and I must say that both teaching and blogging work was in reasonably good supply. There will unquestionably be more in September, however. Finally, if you’d like to view last month’s income report, you can click here.